Eyelid malpositions are the result of forces acting upon the eyelid margin. A normal eyelid should have a quick return snap to the eyeball. Frequently, tendon laxity at the medial and lateral canthi will render the eyelid margin unstable making it susceptible to contractile forces. Based on the contractile forces either entropion, ectropion, retraction or lagophthalmos can occur. The goal in treating a given eyelid malposition is to reposition the eyelid so that the new healing forces will overcome the pathologic forces. The common approaches include eyelid and canthal tendon tightening, eyelid retractor advancement or recession and skin grafting or transposition flaps. This review article briefly describes the various aspects of lid malpositions in detail. Malpostions of the eyelid can result from a host of causes, the consequences of which, can range from mild discomfort to the patient, to even causing potential threat to ocular surface. This article reviews the types, etiology, and management of the common eyelid malpositions except ptosis, encountered in clinical practice. Eyelid malpositions in general are entropion, ectropion, eyelid retraction, and lagophthalmos. Posterior – tarsus and conjunctiva. Causes of entropion may be congenital or acquired. There are three types of acquired entropion, namely involutional, cicatricial, and spastic. The presenting symptoms can be varying from redness and pain around the eye, sensitivity to light and wind, sagging skin around the eye, excessive tears, and decreased vision, especially if the cornea is damaged. Gross eyelid distortion + metaplastic eyelashes + presence of keratin plaques + eyelid retraction causing incomplete trichiasis. Upper eyelid entropion occurs secondary to the mechanical effects of microphthalmos and enophthalmos [Figure 3]. Lower eyelid entropion is caused by maldevelopment of the inferior retractor aponeurosis. Tarsal kink is a rare congenital eyelid anomaly manifesting with severe entropion, which may lead to corneal opacity and consequent  amblyopia. Modified temporary eyelid margin suture for tarsal kink correction provides better mechanical traction on the tarsal plate by drawing the upper eyelid down to the lower eyelid. Treatment involves excision of a strip of skin and muscle and fixation of the skin crease to the tarsal plate (Hotz procedure). Involution of the soft tissues of the orbit, particularly the orbital fat, may lead to involutional enophthalmos, which in turn can lead to unstable eyelid position with entropion. Spastic closure of the eyelids allows the orbicularis oculi muscle to overwhelm the oppositional action of the lower eyelid retractors, resulting in an inturning of the eyelid margin and further irritation of the ocular surface from the inturned eyelashes. This occurs when there is spasm of muscle of Riolan (due to irritation) and lack of support of eyelid by the globe. It can be precipitated by intraocular surgeries. Cicatricial entropion occurs due to cicatrization of palpebral conjunctiva. 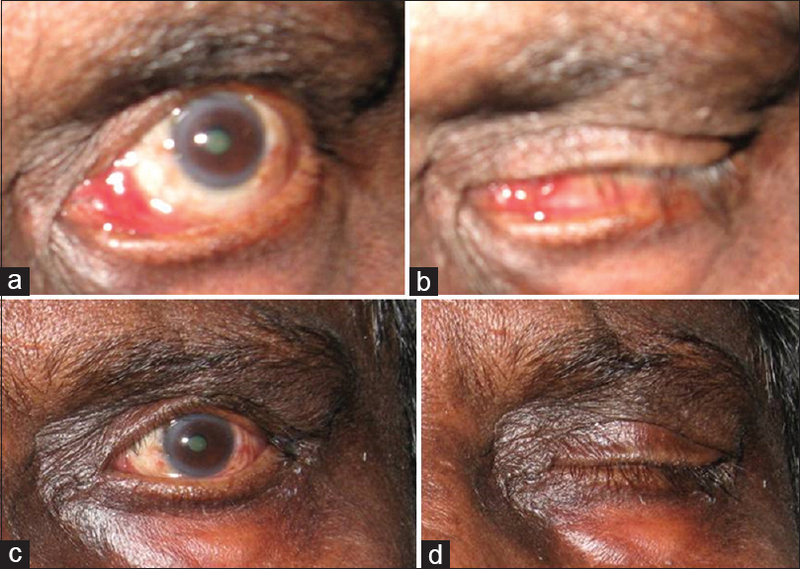 Patients with cicatricial entropion usually display scar tissue of the conjunctiva, usually a result of trauma, chemical burns, Stevens–Johnson syndrome, ocular cicatricial pemphigoid, infections, or local response to topical medication. Examination of the tarsus and palpebral conjunctiva usually points to the diagnosis in these cases. system for acquired lower lid entropion - see [Figure 4]. Sutures are passed to correct the lamellar dissociation as follows:(a) transverse sutures prevent upward movement of preseptal muscle and (b) everting sutures tighten the lower eyelid retractors and evert the eyelid. Transverse eyelid split + everting sutures – eyelid is split transversely to create fibrous tissue scar barrier which prevents the upward movement of preseptal muscle. Everting sutures shorten the lower eyelid retractors. Transverse eyelid split + everting sutures + horizontal eyelid shortening – lower eyelid retractors are mechanically tightened and double armed sutures are passed full thickness through the eyelid, entering the conjunctiva posteriorly low in the fornix and exiting on the anterior surface of the eyelid just inferior to the eyelashes. Sutures are tied tightly to give a slight overcorrection, which are left to dissolve over 10 days, and scar tissue holds the retractors in place. The scar forms a barrier for the overriding preseptal orbicularis. Plication of lower eyelid retractors [Figure 5]a and [Figure 5]b creates a barrier to the upward movement of preseptal muscles:. Treatment of spastic entropion – Quickert procedure. Eyelid falls away or is pulled away from its normal apposition to the globe. Contributing factors are similar to entropion. Orbicularis tone: tested by forced closure of eyes, compared with other side also. Causes of ectropion may be congenital or acquired. There are five types of acquired ectropion, namely involutional, cicatricial, paralytic, mechanical, and congenital. Congenital ectropion is rare and occurs usually in the lower eyelid. It occurs due to vertical deficiency of anterior lamella. Congenital ectropion may be isolated or associated with Down syndrome. Treatment option depends on the predominant component of laxity, whether medial, lateral, or both; accordingly, single procedure or a combination of procedures can be used. Lateral canthal tendon plication [Figure 9]. The canalicular part of medial canthal tendon is shortened by suturing the medial end of lower tarsal plate to the main part of medial canthal tendon with a buried nonabsorbable suture. 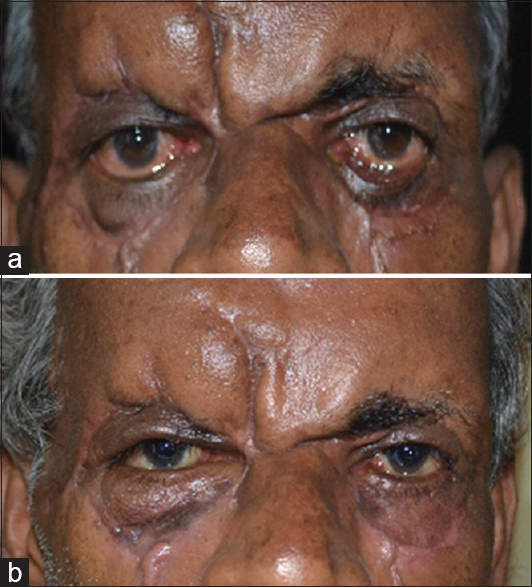 See [Figure 10] for punctal ectropion. 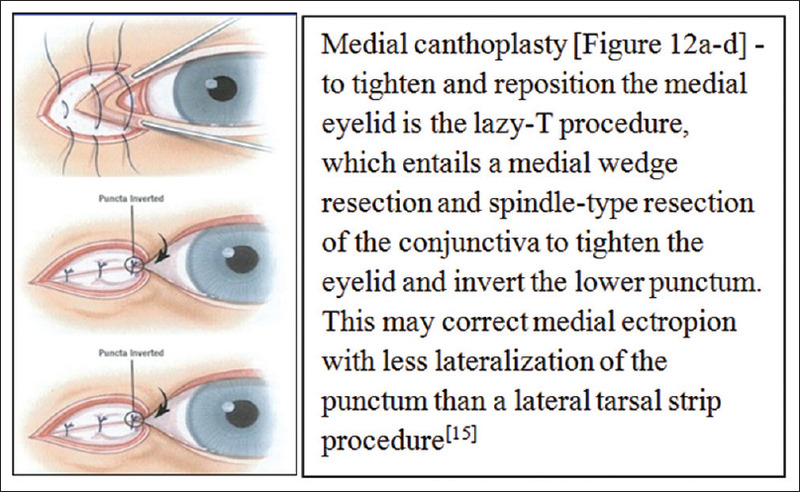 See [Figure 11] and [Figure 12]a, [Figure 12]b, [Figure 12]c, [Figure 12]d for medial canthoplasty. 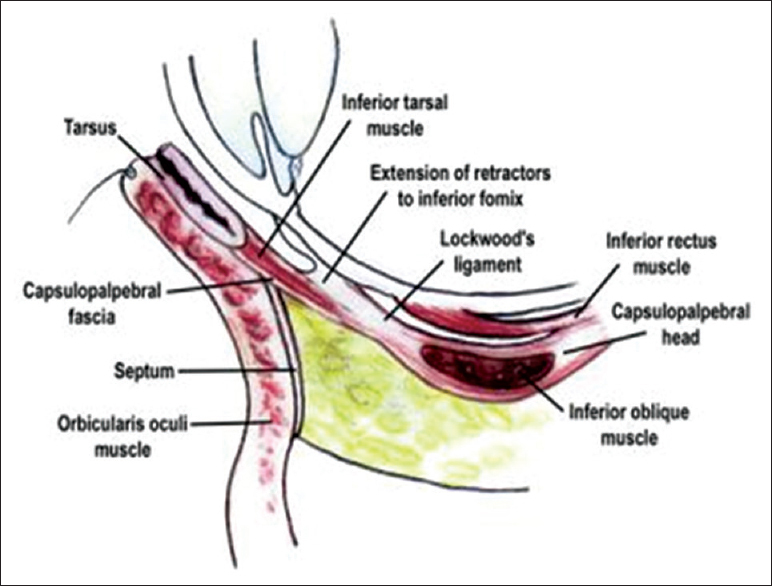 See [Figure 13] for fascial sling. The anterior lamella is vertically lengthened via a midface lift or full-thickness skin graft. Z-plasty: Done in localized scar. Either single/multiple Z-plasty can be done. Each Z increases the length of wound by 30% and redirects it by relaxing the area under tension [Figure 14]. Normally, upper eyelid lies 1–2 mm below the superior limbus and lower eyelid margin just touches the inferior limbus. 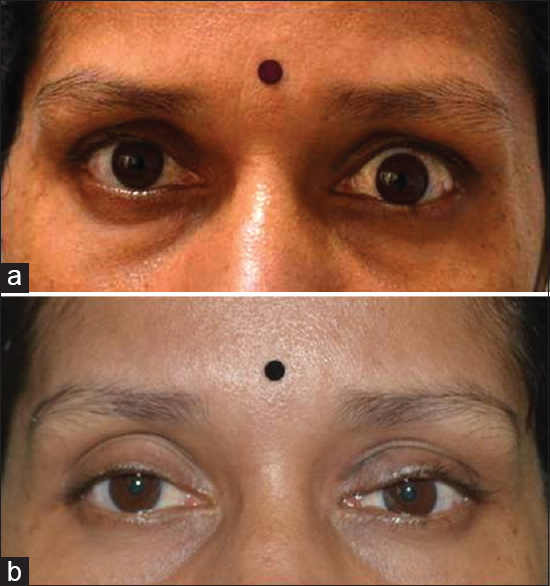 Pseudoretraction may be seen in cases of contralateral eyelid ptosis with a Hering effect. In the presence of unilateral ptosis, equal central nuclear outputs to both levator muscles may result in elevation and retraction of the previously normal opposite eyelid. Pseudoretraction of the elevated eyelid is suggested when on gently lifting the ptotic eyelid, the retracted eyelid returns to its normal resting position. Similarly, digital closure of the retracted eyelid results in elevation of the opposite ptotic eyelid. Management: only observation, surgery is deferred till 4 years of age unless retraction is severe and causing exposure of cornea. Aberrant regeneration of third nerve. Orbital floor fracture/basilar artery disease. Other important myogenic causes are postsurgical complications of vertical rectus muscle recessions, ptosis overcorrection. Eyelid retraction associated with Graves' disease may show some improvement following the treatment of dysthyroidism. Surgical correction of eyelid retraction is indicated when it causes exposure keratopathy and for cosmetic indications. Full-thickness anterior blepharotomy – Koornneef procedure [Figure 15]a and [Figure 15]b:Surgical procedures in cases with thyroid eye disease are not performed until the ophthalmopathy is fully stabilized, which takes about 6–12 months. Until this time, botulinum toxin can be used as a reliable adjunct to the treatment of eyelid retraction. An average drop in the upper eyelid of 2–3 mm can be achieved with a transconjunctival injection of 2.5–5 units for about 3 months. Lower eyelid retraction associated with thyroid-related orbitopathy can be managed by transconjunctival recession of lower eyelid retractors with/without the use of spacer materials. Mild lower eyelid retraction can also be treated with fillers such as stabilized hyaluronic acid. Botulinum toxin chemodenervation to induce a protective ptosis – 7.5 units of botulinum neurotoxin type A is injected into the levator muscle. Prosthetic replacement of the ocular surface ecosystem device provides a liquid bandage to protect the cornea from eyelid interaction and desiccation, in addition to improving vision. Kemp EG, Collin JR. Surgical management of upper lid entropion. Br J Ophthalmol 1986;70:575-9. 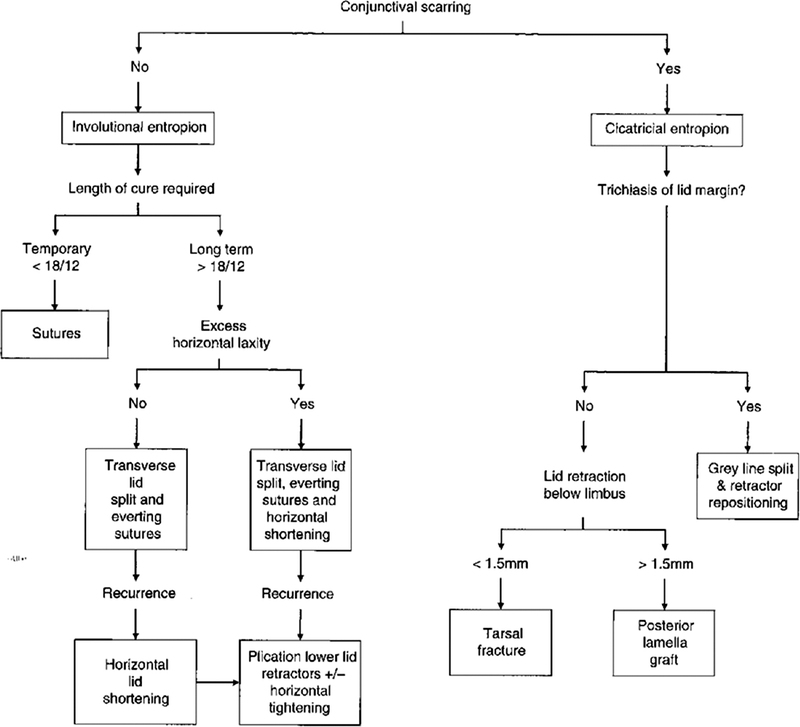 Jordan R. The lower-lid retractors in congenital entropion and epiblepharon. Ophthalmic Surg 1993;24:494-6. Aziz S, Bhatt PR, Lavy T, Dutton G. A simple correction for congenital tarsal kink associated with distichiasis. J AAPOS 2006;10:281-2. Kakizaki H, Selva D, Leibovitch I. Cilial entropion: Surgical outcome with a new modification of the Hotz procedure. Ophthalmology 2009;116:2224-9. Ahuero AE, Hatton MP. 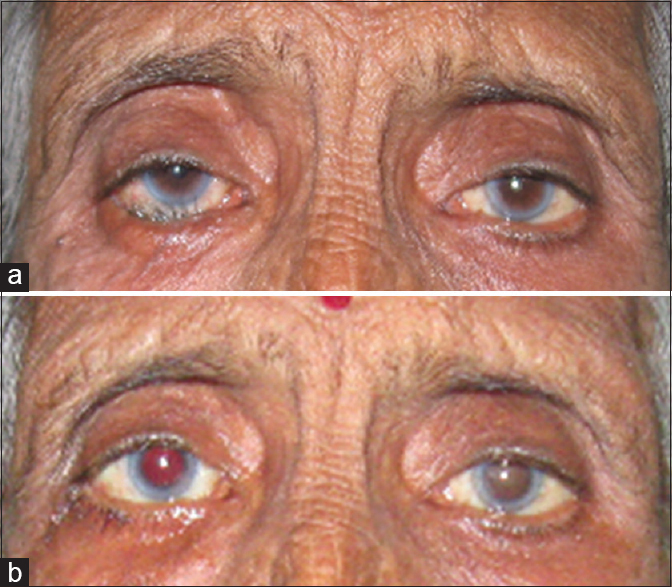 Eyelid malposition after cataract and refractive surgery. Int Ophthalmol Clin 2010;50:25-36. Lance SE, Wilkins RB. Involutional entropion: A retrospective analysis of the Wies procedure alone or combined with a horizontal shortening procedure. Ophthal Plast Reconstr Surg 1991;7:273-7. Quickert MH, Rathbun E. Suture repair of entropion. Arch Ophthalmol 1971;85:304-5. Jones LT. The anatomy of the lower eyelid and its relation to the cause and cure of entropion. Am J Ophthalmol 1960;49:29-36. Kersten RC, Kleiner FP, Kulwin DR. Tarsotomy for the treatment of cicatricial entropion with trichiasis. Arch Ophthalmol 1992;110:714-7. Sodhi PK, Yadava U, Mehta DK. Efficacy of lamellar division for correcting cicatricial lid entropion and its associated features unrectified by the tarsal fracture technique. Orbit 2002;21:9-17. Nerad JA. Techniques in Ophthalmic Plastic Surgery-E-Book: A Personal Tutorial. Elsevier Health Sciences 2012. Anderson RL, Gordy DD. The tarsal strip procedure. Arch Ophthalmol 1979;97:2192-6. Leone CR Jr. Repair of ectropion using the Bick procedure. Am J Ophthalmol 1970;70:233-5. Choi SJ, Park SH. Surgical treatment of facial paralysis by using static ancillary procedures. J Korean Soc Plast Reconstr Surg 1998;25:1531-9. Fox SA. A medical ectropion procedure. Arch Ophthalmol 1968;80:494-5. Bartley GB. 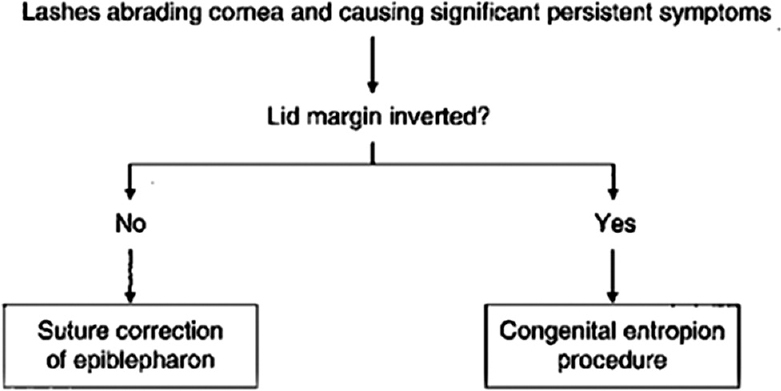 The differential diagnosis and classification of eyelid retraction. Ophthalmology 1996;103:168-76. Wesley RE, Bond JB. Upper eyelid retraction from inferior rectus restriction in dysthyroid orbit disease. Ann Ophthalmol 1987;19:34-6, 40. Yücel OE, Artürk N. Botulinum toxin-A-induced protective ptosis in the treatment of lagophthalmos associated with facial paralysis. Ophthal Plast Reconstr Surg 2012;28:256-60. Silver AL, Lindsay RW, Cheney ML, Hadlock TA. Thin-profile platinum eyelid weighting: A superior option in the paralyzed eye. Plast Reconstr Surg 2009;123:1697-703. Dimit R, Gire A, Pflugfelder SC, Bergmanson JP. Patient ocular conditions and clinical outcomes using a PROSE scleral device. Cont Lens Anterior Eye 2013;36:159-63.